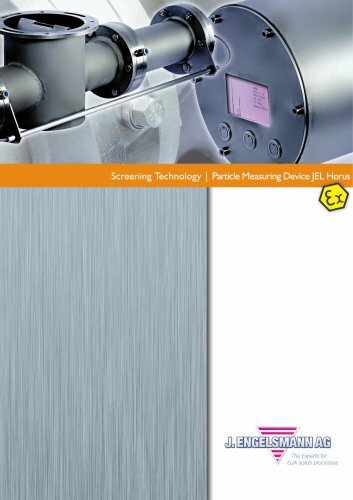 Additional Equipment / Technical Data Additional Equipment In order to be able to perform fault-free particle measurement, product agglomerates that may form during the screening process must be disintegrated before measuring. In general, agglomerates are formed due to electrostatic charge. In such cases, a compressed-air chamber is installed in front of the particle measuring device JEL Horus, in which shear flow is generated by means of specially arranged slot nozzles. This shear flow of air disintegrates existing agglomerates before they enter the particle measuring device.